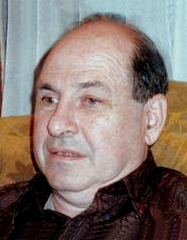 Danny Kleinman In the June, 1981 Las Vegas Backgammon Magazine, Henry Wattson denounces Double Eliminations as "unfair" to players losing early. In illustration (see here), he shows correctly that a loser in the round of four of the Main Draw must then win five matches to finish first. Extrapolating from this, he builds a chart for players in loser's brackets, increasing by two the number of matches a loser must win for every round earlier that he loses his Main Draw match. This is poor arithmetic, which makes it seem that a first-round loser in a sixty-four-player Double Elimination must then win thirteen matches to finish first, only a 1-in-8192 chance. In truth, however, this first-round loser need only win ten matches, a 1-in-1024 chance. 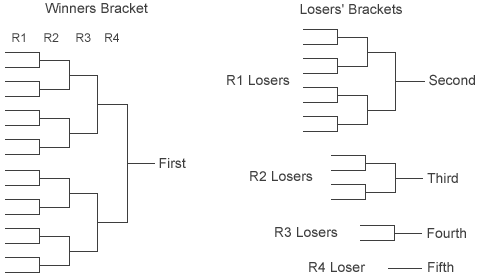 To see this, let us examine the general conditions of elimination tournaments. Suppose we start with a field of perfect size, some power of 2, say the nth power of 2. We match winners against winners, losers in any given round against others who lose in the same round. After n rounds, one unbeaten player remains. There are also n once-beaten players in n "losers' brackets": one winner among the first-round losers, one winner among the second-round losers, . . ., one nth-round loser. We can stop here. We can declare the unbeaten player first, the nth-round loser second, the winner between those losing in round n−1 third, the winner among the losers in round n−2 fourth, and so on. This "Michigan Movement" gives us n + 1 prize winners without lengthening the tournament. It is sound and fair. Losing only one match never knocks a player out, but does limit how high he can finish in the tournament. Double Elimination attempts to retain a chance for any one-time loser to finish first. This requires two steps. First, the n one-time losers after n rounds must play a mini-knockout. For n from 5 to 8 (a field size from 32 to 256), this "playoff" requires another three rounds. If byes are needed, it seems natural to assign them to those lasting longest in the Main Draw. Thus in the playoff among one-time losers from an original sixty-four-player field, byes will be given to 5th and 6th round losers. These two survivors will have two playoff rounds; the other four will have three playoff rounds. But after the playoff produces a winner from the combined losers' brackets, a second step is required: to match this playoff winner against the unbeaten player. The playoff winner must then win two matches to finish first, a further lengthening of the tournament. These two steps combine to add five rounds to the Double Elimination (only four if the unbeaten player wins the first of the two matches against the playoff winner). In a properly run Double Elimination, the loser in the round of two must win four more matches (not three, as Henry says) to finish first; a loser in the round of four, five more matches; and a loser in the round of eight, seven more matches. But beyond this, for each round earlier in which a player loses his Main Draw match, the number of matches he must then win increases by 1, not 2. The relatively small chances of players in the loser's brackets to finish first make the Double Elimination mainly a waste of time. 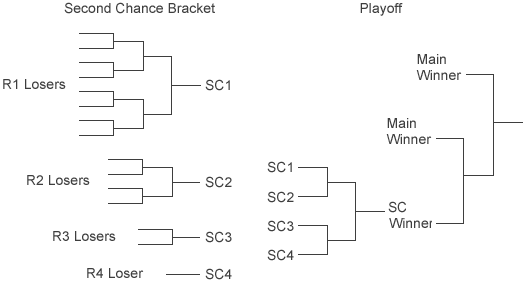 The playoffs, after all, determine only the order of finish among prize winners, not which players win prizes. And they require the unbeaten player to wait while the others play three rounds, just to risk a one-in-four chance of finishing second instead of first. For this reason, I much prefer the Michigan Movement. What about Henry's own "Second Chance" format used in the Plimpton Cup? It gives the once-beaten player excellent chances, but it is unfair. Strange as it may seem, Henry's "Second Chance" entrants have every bit as good a chance as unbeaten Main Draw players; fairness requires that they have poorer chances. Lasting longer in the Main Draw before losing hurts rather than helps, for it may deprive a player of the chance to enter the Second Chance in time. It would be much fairer if each Main Draw match won counted just as much for a player as a match won later in a losers' bracket. Henry Wattson's "Second Chance" format is unfair, and the usual "Double Elimination" is inconvenient. Only straight knockouts and the Michigan Movement are without defect.